Week 118 and when I delved into Mary Berry‘s Baking Bible this week I was looking for appropriate birthday cake for my other mum and one of my chief tasters. Death by Chocolate definitely seemed to fit the bill! 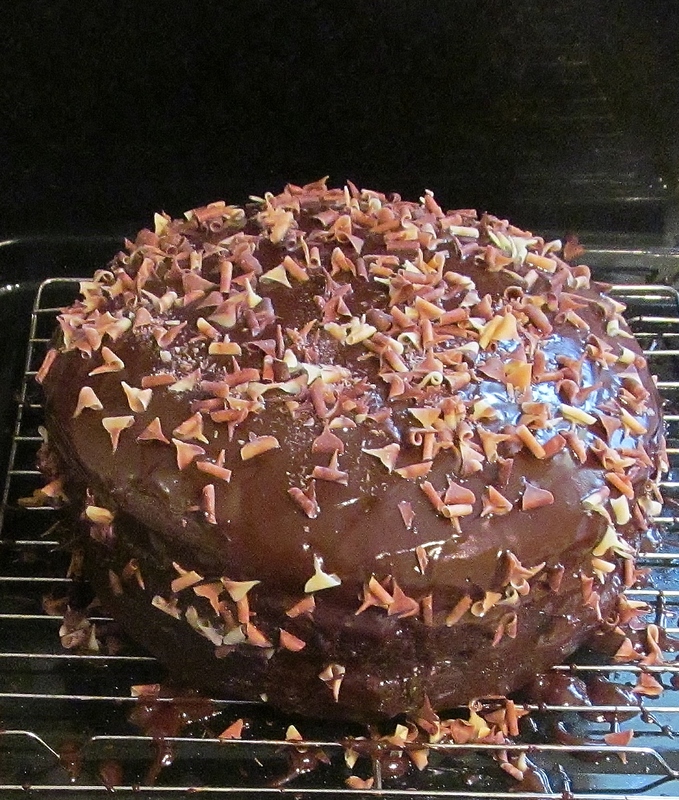 This is a seriously chocolatey cake and the first step Mary asks you to do is grease and line 2 sandwich tins. The sponge mix has a lot of cocoa powder in it as well as golden syrup and vegetable oil. I followed the step by step instructions for mixing and poured the mix into the tins and put them in the oven. When the pinger went, I took out 2 beautiful chocolate sponges and put them on the airing racks to cool. 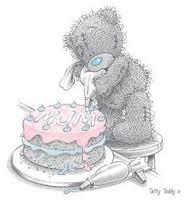 Mary then asks you to cut each sponge in half so this cake will have 4 layers….gulp. Next step was to tackle the icing. This is where the “death” bit comes in. Mary asks you to melt 450 g or 1 lb of dark chocolate! I have said before that I really am not a fan of dark chocolate but most of my tasters are so I compromised with 3/4 dark chocolate and 1/4 milk chocolate to try and take the bitterness of the dark chocolate away. Once the chocolate has been melted, Mary then asks you to add the 200g of butter to it and allow it to melt into the chocolate…… ( cholesterol comes to mind….lol) . Mary then asks you to sandwich each layer of the cake together with this icing and then stand the cake on a wire rack and use the rest of the icing over the top and sides of the cake! I gave it a liberal covering but still had some icing left over. Mary asks you to leave it to set then decorate with coarsely grated plain and white chocolate. I must admit I ” cheated” here by buying a pot of ready mixed chocolate curls! The cake went down well and I would like to take this opportunity again to wish my other mum and one of the chief tasters a happy birthday! The second recipe was Mary’s swiss roll recipe. 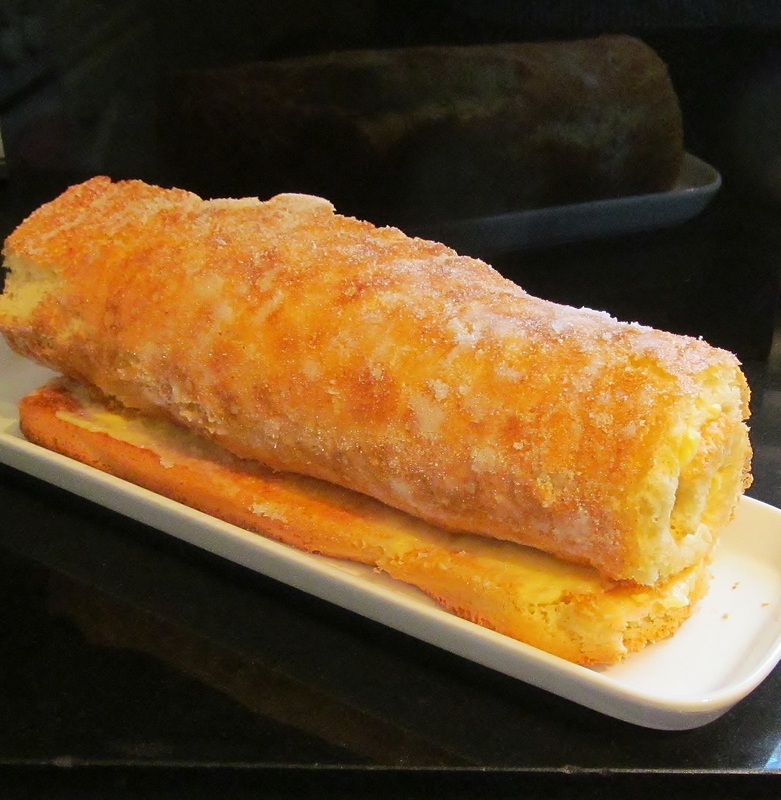 I have tackled some of the swiss roll recipes before with varied success. The baking part isn’t the issue it’s the rolling! The sponge is a fatless sponge and easy to make. I whisked it all together and poured it into the prepared swiss roll tin. I put it in the oven for ten minutes and while it was baking put a sheet of greaseproof paper on the side with caster sugar sprinkled on it. Soon enough the sponge was done and I tipped it onto the prepared paper. Mary asks you to allow to cool “slightly” and then spread with jam. Slight hiccup here, my jam had grown a lovely mold on it so I quickly made some buttercream and used this instead. I rolled the cake into the roll and again , it split to my dismay but not all the way through. I sprinkled it liberally with caster sugar and took the photograph! 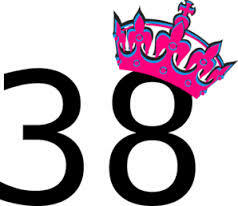 Well the countdown has now reached 38….. so near yet so far! Pascal Parent Photos Pascal Parents new and updated photography blog site.